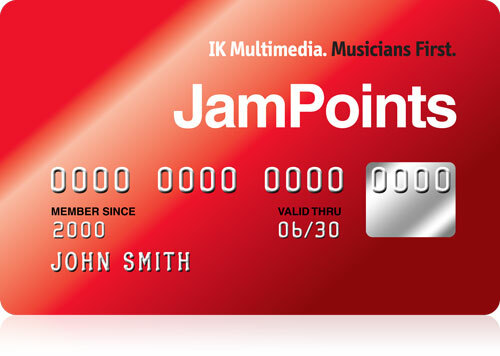 JamPoints™ - IK Multimedia rewards program. Earn Points, Get Cool Gear! We're pleased to introduce our program that rewards YOU for being a valued member of the IK Multimedia family. The IK JamPoints™ rewards program lets you earn points and then redeem them for IK products! Introducing Welcome JamPoints, it's where you get more just by being a part of the IK Community. From now on, anyone who creates a new IK User Account gets welcomed with 5 free JamPoints in their User Area. Whether they are free or purchased, all you have to do is register your IK App Store or Google Play App and you are eligible. This includes AmpliTube Custom Shop FREE, T-RackS Custom Shop FREE and SampleTank FREE for Mac/PC. Earn 5 Free JamPoints when you sign up for our Newsletter and create an account or participate in our Forum, account required to post. Users can only receive 5 Welcome JamPoints one time for one account. How do I get started and earn JamPoints™? If you're already an IK Multimedia product owner, then you are automatically enrolled – when you purchase/register an IK Multimedia hardware or software product from a retail store or from the IK Multimedia Online store, you will receive IK JamPoints™ to get discounts on future IK purchases! JamPoints™ are redeemable only in the IK Online Store, and they can be applied to any current product in the store. You can see your accumulated point balance at any time by logging into your User Area. How do I get points from a retail store? You won't actually get points directly from the retail store but rather when you register the product on our web site. IK JamPoints™ are placed in your User Area account based on the registered products that you own. You can redeem these points in the IK Store for discounts on products. Note: JamPoints can only be redeemed in the IK Online Store. Retail stores do not accept JamPoints for partial payment of goods and services. Login with your Username and Password. Once you have successfully logged in, you will see your Username and how many JamPoints you've earned at the top of the screen in red letters. Browse and shop for the item/s you wish to purchase. In the shopping cart section, there is a "JamPoints" field where you can redeem your JamPoints. Use all of your points or just part of them to generate a "discount" promo code that you will apply to your purchase at the time of checkout. A maximum of 30% of the product value can be paid by JamPoints™. There is also a "Remove" button if you want to edit the amount or cancel your JamPoints on your order. Do JamPoints™ and Promo Codes expire? Yes. Promo Codes expire 2 hours after generating them in the IK Online Shop. If you do not use the Promo Code within the 2 hours they are generated, the unused JamPoints will go back to your balance and you may use them at another time. JamPoints™ expire after 24 months at the end of the quarter. On the JamPoints™ page in your User Area, it displays when your JamPoints™ were generated. Every time you register a qualifying product purchased from an IK retailer, from our online store, App Store or Google Play, you get IK JamPoints™. You can also earn JamPoints™ through other activities and involvement with IK. IK JamPoints™ are calculated as 5% of the Manufacturer's Suggested Retail Price (MSRP excl. tax/VAT) of a product. If you need to check the MSRP of a product, simply go to the Product Features page on our web site and look at the left side. You can also see the MSRP in the IK online store. If you purchased a product whose MSRP is $229.99, you'll receive 12 JamPoints™ in your account. In the spirit of rewarding you, we always round up to the nearest point. Let's say you have earned points on 4 previous qualifying IK products. Your new purchase puts you at 5 qualifying products. Your additional bonus points are calculated as 12% of the points which you get from your 5th purchase. So if your 5th purchase is a product with a MSRP of $229.99 (ex tax/VAT) you'll receive 12 points for the purchase, PLUS an additional 2 bonus points (12 points for the purchase + 12% bonus = 2 additional points) for a total of 14 IK JamPoints™. The point is; the more you buy, the more you own, the more you earn, the more you get. We're here to help you. If you can't find the answers to your questions about this program, please contact us. This is an exciting time to be an IK Multimedia customer, and we sincerely hope that you enjoy participating in the IK JamPoints™ rewards program. You are eligible to participate in the JamPoints™ Rewards Program if you are currently a registered user of one of our mobile apps, software or hardware products. Plus signing up for our newsletter or becoming a Forum member can also get you in on the action. This program excludes IK and affiliated employees. That's what it's all about. You buy stuff, you earn points. When you purchase products, either from an Authorized Reseller or from our Online Store, you earn 5% of the Manufacturer's Suggested Retail Price (excl. tax/VAT). We calculate this at the time of registration of the serial number on our web site. You can check your accumulated and individual totals at any time by logging into your user area on the IK web site, and clicking the JamPoints Rewards icon. JamPoints™ have no cash value. Once you earn points through the system, they show up automatically in your User Area. You can redeem your points easily while shopping in the IK Store or the AmpliTube Custom Shop. During your order, you will be required to login with your IK Username/Password. Once logged in, your current JamPoints™ will be visible, to which you can apply a maximum of 30% of the product value paid by JamPoints™. It's really that easy. NOTE that JamPoints™ expire after 24 months at the end of the quarter. On the JamPoints™ page in your User Area, you can simply move your mouse over your displayed JamPoints™ to see when they will expire. When a product has been transferred, either by using a License Transfer Credit in your User Area > My Products or by IK Multimedia Support/Service, the JamPoints earned for that purchase will be removed upon completion of the transfer. If those JamPoints were not used from the transferred product, those JamPoints are removed from your account and are not transferred to the new user. If those JamPoints were applied to an order and the product was then transferred, that will cause your JamPoints total to enter a negative state. This will be reflected by a negative (-) value in your User Area > JamPoints and when viewing the online store or Custom Shop. Registering new qualifying products will reduce the negative value, eventually reaching 0 or higher. Second hand purchases, In-App purchases, iLine cables, NFR (Not For Resale) versions, OEM versions, discontinued products, license transfers, merchandise (including clothing), Sound Download Reactivations and books. Generated JamPoints Promo codes cannot be combined with other IK coupon code, other discounts or specials. All points are non-transferable. We reserve the right to cancel or modify this program at any time for any reason.